Today I went with my friend Jane to Corpus Christi Church to catch the last Mass of the priest there, Father Anzelm Chalupka, aka Father What-A-Waste. Note to non-Catholic Leonard Pennario fans: That is an old Catholic joke, Father What-A-Waste. Every time it is applied it is new again! Father Anzelm is being sent to Yonkers. The church was packed which was the objective. The Facebook group hyping the event was called "Father Anzelm's Last Mass: Let's Pack The Church." 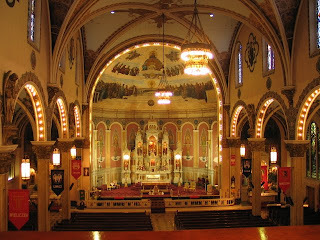 Here is a picture of the interior of Corpus Christi. All the news media were there. TV cameras were following Father Anzelm's every move and he took advantage of that situation to give the greatest sermon. The first part was about how Darwin was not necessarily right and the jury is still out. Father Anzelm pronounced Darwin's name "Darvin." He is from Poland! 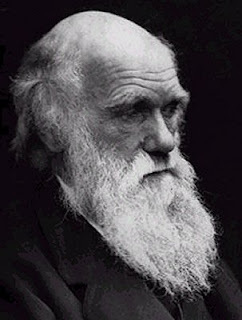 He said that history may well prove Darwin wrong. He said that back before we knew the world was round, everyone thought the world was flat and there were very wise people who professed that. You have to admit, he has a point! ... even though I grew up just two streets away from Darwin Drive in Snyder, how about that? And I drove down Darwin just the other day. Well, after that the sermon moved on to how even if what we believe what Darwin says, it gives us no reason to behave like animals and subscribe to this survival-of-the-fittest theory. Meaning, the strong should not kill the weak, i.e., the aged and the unborn. Jane and I got to hug and kiss Father Anzelm on the way out. Father Anzelm thanked us because both of us have interviewed him for the paper during his time here. Our friend Airborne Eddy was with us. Eddy was hoping we would be able to get Father Anzelm to go out for a beer. I said, "Eddy, I don't think we will be able to get him today." The line went on forever! Plus the TV news people were in our way. So, an exciting day. And before that I went to my usual Latin Mass. That reminds me, it is Septuagesima Sunday! That means pre-Lent. I remember when I was in California, that was my first Septuagesima Sunday. Pennario and I discussed it. 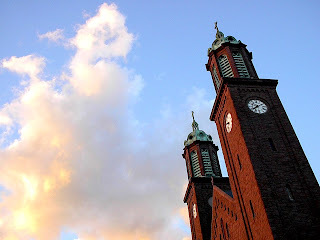 Today it was funny because I went to two Masses and they were different. At Corpus Christi it was just a normal Sunday with green vestments. But at St. Anthony the vestments are purple and there is no Gloria or Alleluia and boom, for all intents and purposes it is Lent. I am leading a double life! I got a new iPhone and it has been fun figuring it out. Or not figuring it out, as has been more the case. This week has been jammed and so I have been paying rent on this thing without actually using it. I do want to master it sooner or later because one thing I want to do is download Leonard Pennario ringtones. Searching around the 'Net for this and that, I have encountered them. An ad will bounce up saying: "GET YOUR LEONARD PENNARIO RINGTONE!" Which I love. I love that! Just as a feeler I did a search to see if I could find Gary Graffman or Leon Fleisher ringtones. They are contemporaries of Pennario's and maybe I could get their ringtones too. I could assign them to my friends! The phone would ring and I could say, "Oh, that is Gary Graffman, so that must be my friend Gary." But I could not find any Fleisher or Graffman ringtones. Gary Graffman and Leon Fleisher should get on the stick! Back to my difficulties with my iPhone. It is so pathetic that I have had to rely on my mother to figure it out! I was at my mom's and my mother has a cell phone which she is disgusted with because she cannot even be bothered to get to square one with it. She has given the number to only one person and it is not me. It is my brother George. In my mom's electronic phone book, which has two numbers, he appears as "georges." That is stylish! It is like Georges Bizet who wrote "Carmen." We saw his grave in Paris. When I figure out how to do ringtones I will assign my brother Georges the "Seguidilla" which is my favorite part of "Carmen." Or perhaps I should go with the "Toreador Song" which might suit Georges' personality more. My mom's cell phone was beeping for some reason -- burping, was the word my mother used. From time to time it goes, "Burp." So we were trying to figure that out. Meanwhile my iPhone made a noise and it was a text message. It was Howard asking me to come down to Jocko's for a glass of wine. Welcome news! A welcome invitation and of course I wanted to text him back immediately and accept. But that was not that easy. When I tried to text back all I got was a blank screen and no instructions. "Ha, ha!" my mother laughed appreciatively. I was waving my fingers all over the screen because I knew there was some way to make a typewriter keyboard appear. Finally my mother made a suggestion. "I think if all you do is sit and wait, the keyboard will come up," she said. This morning I tried that, and she was right! I would never have figured that out on my own. I remembered my mother's suggestion and that is why I tried it. So, one thing mastered. The Leonard Pennario ring tones are next! The miracles of the Internet! Favors are granted and questions answered. For instance there is the situation with yesterday's big bird. My friend Marta, yesterday, thinks that the owl I saw might have been a giant stork! "Maybe it's visiting from Morocco," she wrote. Marta just came back from Morocco where giant storks and their giant nests were everywhere. An awe-inspiring concept! Imagine walking down the street and seeing a giant stork in a giant nest. It sure gives a new meaning to getting a visit from the stork, that is all I can say. 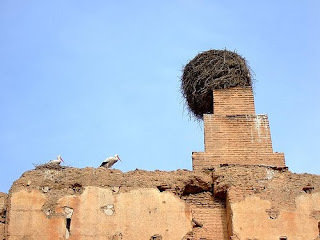 Holy cannoli, here is a picture of a giant stork nest in Marrakesh! Then again the nest I saw was in the ballpark. Get it, ballpark? I am pretty sharp for not even 9 a.m. and having been up late last night. 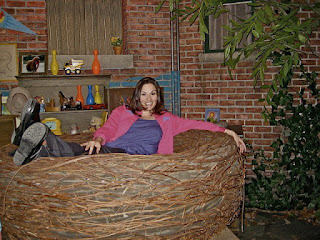 Remember on "Sesame Street" you would see Big Bird and sometimes you would see Big Bird's nest? I keep thinking about that. Big Bird's nest would take up the whole screen and Big Bird would be sitting there in it, weaving twigs or whatever. That is Big Bird's nest at the top of this post! I love the '70s toys on the shelves. I grew to love music because of "Sesame Street." They played Mozart's "Eine Kleine Nachtmusik" and I kept hoping to hear it again, which, luckily they played it over and over, and I got hooked. One minute I am watching Big Bird, the next, I am slaving away at this book about Leonard Pennario. That is something to think about. 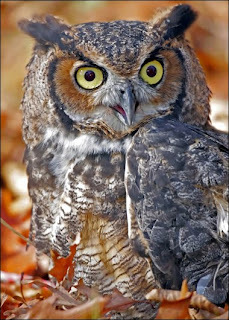 We have one more theory about the bird in Delaware Park and that comes from Howard's friend Dave Pettigrew who thinks the owl was a red-tailed hawk. He said owls are active at night. I do not remember seeing a red tail on this bird but maybe I was too startled to notice. I love how my friend Larry writes, why don't you take a picture? Because the thing would eat my camera, that's why! It is the crow update! 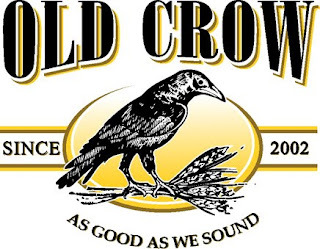 Remember the crows? One thing I did not mention was that besides mobbing the trees in back of the house, they bombed the car. I was still in it at the time because I was listening to Leonard Pennario playing Brahms and wanted to wait until it ended. I was listening to this Brahms and watching the crows wheel all over the sky and wondering what all this was adding up to. Then ... pow! Crow poop all over the car! What primitive behavior! Hence the term Crow Magnon Man. Plus there was this clattering. The crows had thrown sticks down too. There were sticks and twigs lying on the trunk. All we could think later was that the crows had bombed the car as a warning to the owl. We were reading up on crow behavior and when the "mob" somewhere, that is gather by the hundred and caw and caw like crazy, it is a show of strength in the face of a predator. Usually there is an owl nearby. Or an eagle. Or a hawk. Perhaps it is one of the great birds of prey at the zoo! Now that they have gotten rid of that huge Victorian vulture cage perhaps the vultures are running around free. Does anyone else miss that huge Victorian vulture cage? It had its own foundation and everything. Howard and I have mourned the loss of that cage because both of us loved it. Back to the crow do-do. We had to take the car through the car wash and even after that, some of the crow do stuck. That is how tenacious it is! A show of strength of the first order, that was what we had witnessed. Surely the bird of prey, whatever it was, had fled, its feathers ruffled. That was what we thought until we took a walk around the Delaware Park Ring Road. A couple of Buffalonians had paused in the path and they were staring up at something. We joined them. And we soon saw what they were looking at. There was a great big bird sitting in a tree! As we were watching the bird lifted its wings and flew off. It looked like an owl to me, rounded and with a big chest. Howard thought owl too, or maybe eagle. The bird flew to a tree in the middle of the meadow. And in the tree was a huge nest. You could see it clearly from even where we stood, which was quite a distance away. The bird flew into this nest and there it still sits, I imagine, feared and unchallenged. Howard looked around and pointed out there were no other birds in the vicinity of the park meadow. This bird knew its turf and it owned it. No one will come near it! Has anyone seen this bird? 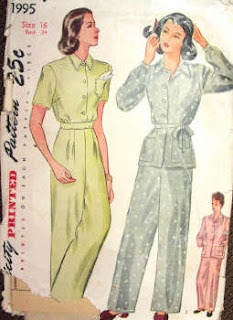 Yesterday's post about the purchase of my used pajamas produced a host of opinions about estate sales! Who knew people were so conflicted? 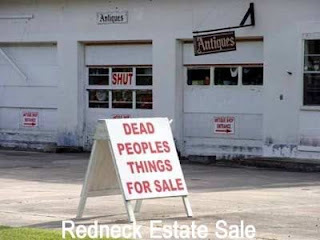 It seems that a lot of people out there agree with Howard that estate sales are depressing because you are buying the things that belonged to someone who had passed away. Well, Howard has been trying to explain that it is not that, strictly speaking. It is that the people who go through the estate sales treat the items with disrespect. At least, they ignore that a life was lived there, a life that odds are has ended. Here is what is strange. I go to these estate sales, I have to say, because of my mother. If my mother did not want to go, I probably would not go! Which I have laughed about with my mom, because the truth is, my life has improved because of these sales. I have a grand kitchen timer, a kitchen scale, new pajamas, all kinds of things I did not know that I needed but now have, because of going to estate sales with my mother. Now, my mother is older than I am and yet she is not disturbed in the least by macabre thoughts while we are at the sales, I will tell you that right now. I am the one curious about the people whose sale it is. She is not! I am the one whispering about what the names of the people are, figuring out what religion they were and whether or not they were music fans. Although truth to tell, their musical tastes have less to do with sentiment as with the odds of finding Leonard Pennario records in the basement. I like to figure out things about these people because I respect them. Sometimes over the years I have bought unclaimed family photographs and have displayed them here and there. I have actually done that. If the people were Catholic, I go in and take the Catholic items: missals, rosaries, scapulars, statues. I do not want harm to come to them and I do not want the sacred items desecrated. And sometimes I run into someone who wants a missal or a rosary and then I have one. All I can think is that the, ahem, deceased would appreciate this. You want your treasures to go into good hands. If they have bum families, oh well. Where these people are now, they are beyond all that. Still you cannot take everything. One memory tugs at my heart. That was years ago when I was at an estate sale in the home of a woman I figured out had been a reporter for the Courier-Express. There were extensive scrapbooks of her work, and it distressed me that no one in the family had claimed them. Great family, you know. You would have thought she would have had a niece, a grandchild, someone. So sometimes I wish I had taken those scrapbooks. Journalists' honor! Except where would I have put them? I do not have room for my own clips! These are the matters with which I wrestle. On the other hand one thing to keep in mind is that we really can tell only so much about a person's life from going through an estate sale. We tend to feel sorry for people because they are dead. Just because a person might not have a family to claim his or her stuff does not mean that the person led a sad life. Besides which this person, wherever he or she is now, has more pressing concerns than who is going to buy that one dresser. That is what my faith teaches me and I believe it. Philosophizing! Deep thinking, as I sit here in my used pajamas. Better still, how about half a penny? Today my mom and I had a full slate of estate sale-ing and rummage sale-ing starting at Mill Middle School. That is Mill Middle School, in Williamsville. I bought so many things a kid had to carry it out to my car for me! I got dinner plates and a lamp and a book for one of my nieces. And a mini-fridge. That is what it is called! You can put six cans of beer in it and take it anywhere and it is extremely well insulated so this summer I am going to be very, very popular. We then went to two estate sales at two apartments in Amherst. Zut alors, at one sale, the first thing I found was a music dictionary published in 1909 with all kinds of musical terms and, stuck between the pages, a typewritten list of numbers of instruments in the New York Philharmonic-Symphony. Before it was the New York Philharmonic! That meant it was old. When Leonard Pennario played with that outfit for the first time it still had its old name. Speaking of which, you would think that someone possessed of such an object would also be possessed of Leonard Pennario records. Alas, such was not the case. There were a few piano CDs but no records. Shrewd in these matters, I deduced that when the person downsized and moved to the apartment, all the vinyl went. I did pick up two little 1920s-style bowls made by Syracuse China. They were not priced and that is always a tense moment, when the sales biddies scrutinize them and decide how much to ask. "It's Syracuse China," one of them said appraisingly. But I ended up getting them for $1. My mother was outraged by their hesitant behavior. On the way out she said to me, "I don't know what the big deal was about Syracuse China. It's not as if it's anything great." Not like Buffalo China! Buffalo China would have been a big deal. At the final sale I have to say I was a hit because here we were in a crowded bedroom and first I spoke up and said, "Would anyone mind if I turned off the TV?" The TV was blasting commercials. Everyone looked awed and said no and I turned off the TV. Then when we were shopping in silence, going through this dead person's closets, I spoke up again. I said: "Mom, do you think I dare buy used pajamas?" I got a laugh for that one! And I bought the pajamas too. But shhh. Don't tell anyone. After that Howard and I went to two more estate sales. Howard is new at estate sales and he needs some training. You have to learn not to get depressed when you go to estate sales. Howard thought it was depressing. "It doesn't mean the person died," I said, trying to reason with him as we left this estate sale on Middlesex, this tremendously wealthy street near our house. "Sometimes the person has just moved." "That person died," he said. You cannot go to cemeteries with Howard either because all he thinks about are all the dead people and what they were doing when they died. So when I was with him at the two estate sales I bought nothing. Zip. The karma was not right. This morning I awoke to an unbelievable noise. There were all these crows gathered in three trees, cawing their hearts out. An incredible cacophony of cawing! I had the presence of mind to take important action: I posted the situation on Facebook. And people began letting me know what they thought about all my crows. Some said they were ominous! And other people said they were beautiful. Howard thought they were beautiful. He loves crows and thinks they are smart and sweet. Once when he was walking to school a crow began following him. It would hop in front of him on the sidewalk and wait for him to catch up. Then it would skip ahead of him again and look at him. Then the crow greeted him! "It gave me a proper greeting," he says. "I don't remember what it said." Something like: "Hey, how're you doing?" I think if a crow spoke to me I would remember what it said! But Howard does not. What he does remember is he got to school and eventually he got brave enough to mention to his schoolfriends what had happened, about the crow. And all the kids knew the crow! "Oh, that's Joe," they told him. Anyway, these crows in the trees this morning, they were communicating something. I saw them gathering the night before. They were all wheeling in and flying around like crazy as it was getting dark. Then they must have settled in for the night and this morning they must have awakened at dawn and begun cawing. There is a song in "Die Winterreise" called "The Crow." The crow in that song follows the singer just the way the crow followed Howard to school. Crows must have been doing that for centuries. Listen to the song. Even if you don't know German just listen to the piano. It is haunting! And oddly modern sounding. "Krahe. Wunderlicher Tier." That is one line from the song. It means "Crow. Strange animal." This performance has cool pictures of crows. Oh, my gosh, this is weird. But still no translation! I keep hoping for a translation. Finally, Eureka! Great graphics and a translation. And with Hans Hotter, a singer I love! Think what Schubert did with one crow. What would he have thought if he had seen all of them in the trees this morning!? Speaking of "Die Winterreise" I think Schubert would have liked that picture I put at the top of the post. I took it while Howard was inside the North Buffalo Office Depot. It is so atmospheric! But back to the crows in our trees. I have learned today that when crows gather together like that it is called "mobbing." They get together to gang up on a predator, usually an owl or a hawk or an eagle. There was probably an owl there somewhere. 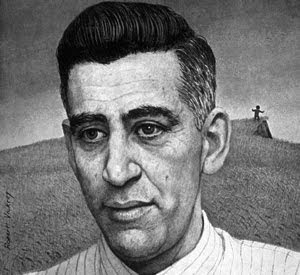 When I am done with my book on Leonard Pennario perhaps I will write a book about that. The mystical behavior of crows! Yesterday after the gym and talking to Maestro Russell Stanger about Leonard Pennario, I went down in the kitchen and began cooking dinner. And Howard showed up and shoved a camera in my face! Howard found a site which lets you do live TV shows, free. And he wanted to test it. So we did an impromptu cooking show! He put the camera in my face and I talked. And luckily I was doing something fancy. I was roasting Cornish hens, which I never do. They were on sale somewhere. And I was roasting Honey Bear squash! So I got to talk about that. I am used to Howard trying all this stuff. He always has some new idea. Almost always it is something high-minded. Last week I said, "Howard, this is like being married to King Arthur." All I could picture was King Arthur telling Guinevere about all his ideas. "A round table! Where all the knights would gather!" Ha, ha! And you can just picture Guinevere yawning. Thinking: What about this new gown I am wearing? What about this wild boar I prepared? I thought it came out just perfectly and now all he wants to talk about is this round table and he does not even notice. Luckily Howard's ideas are not generally as boring. The cooking show for instance was kind of fun. After all my eating today I went to the gym and attended Killer Abs class. I have a strategy for getting myself through classes like this. What you do is, you take your mat and put it right next to the teacher's. As if you are a teacher yourself! Then you do the exercises and smile as you do them and because you are in the front of the room, if you collapse on your mat everyone will notice. My strategy worked well! Here everyone else in the class is grunting and groaning like the poor souls in Purgatory and there I am squatting and squeezing to beat the band. Until the end of the class when I found I could not get up. All those squats and squeezes had gotten to me! I mean, that is me in the picture above! Finally I did and I staggered into the other room using this doorway no one else uses. It leads to the big room with all the treadmills and elliptical machines and whatever. There was a Schwinn exercise bike close to the door and no one was on it so I got on it and sank down. I could not even pedal! I just wanted to rest. I sort of pedaled slowly this way and that so it would look as if I were doing something. When my heart slowed down I went home. That was when I got to call Russell Stanger. That is he pictured at left! He is this eminent conductor and he called me this morning so we could talk about Leonard Pennario. Remember those letters I sent out last summer? One of them was to him. But he had moved so he only just now got it. He called me this morning and I was so happy to hear from him. He wanted to know first thing if I was done with the book. He was hoping he would not be too late to contribute. As if I would be done with this book! Luckily I stifled my laughter successfully. I told the maestro, I would have found him one way or another. I have found all kinds of people, even a few Pennario told me I would never find. I do love asking people about Leonard Pennario. I am going to talk with Maestro Stanger again but we had a nice conversation in the meantime. By the way I called him Maestro. I did not embark upon this project so I could not call people Maestro. Maestro Stanger told me about a time that no place was open after Leonard's concert so they went to an ice cream parlor. And I am thinking, that is so Leonard! Leonard loved his ice cream so much. And he made sure I loved it too. All of a sudden hot fudge and caramel were part of my basic food groups. I am probably still working that off! I thought of Pennario while I was sweating it out in Killer Abs. Howard, what a Web logger! I should think twice before letting him sit in. I should be like a jealous jazz pianist who has a gig that I love and I will guard it and not let anyone sit in. Howard always calls that situation guarding your bowl. That is an expression I love! You just picture this big dog. Yesterday Howard did forget to mention one thing and that is that during dinner we listened to the Melachrino Strings playing "Music For Dining." I do not think anyone has done that for decades. Wow, I just went looking for a picture of "Music For Dining" and up came my own Web log! It turns out I have written about this album before. I bought it at the same estate sale where I bought the autographed picture of John Gilbert. What a nice thing that I wrote that down! Because you forget. And it is nice to know where this record came from. I bought a few other albums along with it, including "A Christmas Carol" with Lionel Barrymore and Artie Shaw's "Moonglow." Also that day I bought the silk dress I wound up wearing to the Buffalo Philharmonic Orchestra gala. Well, that was at a garage sale. Stop me, someone. I am digressing! As it turns out, "Music for Dining" is golden. It is just perfect for dinner. It has this kind of sweep to it and this rich, robust volume. We were playing it on the 1950s Sputnik record player off in the sun room but it sounded as if we had speakers in the dining room. This warm tone. You do not get that from CDs. It provides this kind of cushion-y backdrop but as Howard says, it is as if they engineered it perfectly so it does not interfere with conversation. The music is always above or below the human voice, perhaps that is it. We are wondering. We just know there was something special about this album that made it perfect for dining. In contrast to what we played next, which was Leonard Pennario's "Rhapsody Under the Stars." I remember where I found that! It was in the box of records that came with the stereo that mysterious night when I drove out to Tonawanda and bought it. I thought "Rhapsody" would be OK for dinner. It was light music, right? But as soon as we switched the record, it was not the same. Right away my friend Michelle got distracted. "What is this?" she asked. There was something in "Rhapsody Under the Stars" that hooked her in and that is not what you want for dinner music. The Melachrino Strings is what you want! Here is a picture of George Melachrino. He seems to have been a British bandleader, or orchestra director, or whatever you would call him. 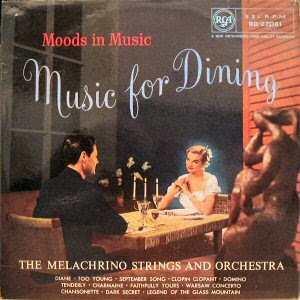 A British edition of "Music For Dining" identifies him as "George Melachrino. The man. The legend." 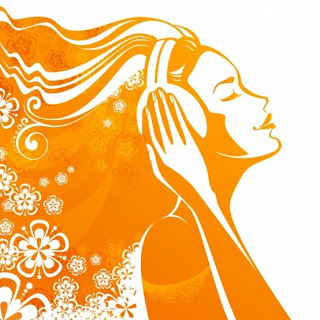 We also own the Melachrino Strings' "Music For Reading" and "Music For Relaxation." Howard gave me "Music For Relaxation" for my birthday. Our "Music For Dining" has an old sticker that says it comes from The Music Box, a record store on Hertel. It says "The Music Box," and an old-fashioned phone number, and "Buffalo 16." Hello, America. This is Howard Goldman, your "Buffalo Bloviator". I'll be filling in for The Wife today. Mrs. Goldman is on assignment and she will be returning tomorrow. She ran off to work to make some deadlines. As she searched for the keys to her Crown Vic, she surprisingly requested that I command her blog. Today I sit before you at The Wife's golden excellence-in-blogging keyboard. I am humbled. The Wife did not provide me with any show prep, but I figure that she would want me to talk about last night's dinner party. We had her boss over for dinner. We are confident in our hosting abilities and in a situation like this, the wildcard is always your Buffalo Bloviator's potential verbalizations. I am pleased to report that by all accounts, I did not ruin the dinner party or even get The Wife fired - as evidenced by the fact that she had to run off to work this morning, and further evidenced by her subsequent - leaving-me-in-charge. We haven't had a dinner party at the house in a long while. We used to entertain constantly but the last couple of years, our projects and hobbies have left the house in a state of disorganization. We deployed Larry to whip the place back into shape. Larry is an old friend of mine and he loves to clean. If you click on the image, it will enlarge and you will notice that Larry has selected a ratio of (2) packs of Seneca cigarettes to (1) can of furniture polish. If he doesn't exhaust the can of polish, he will still exhaust the two packs of cigarettes. When Larry finishes cleaning our house, it is dust-free. I love the smell because it takes me back to my childhood when my parents used to host political all nighters down in our basement. Chain smoking local Democrats used to plot and scheme for hours. Typically against other Democrats. Len Lenihan was just a kid then. Downtown just 45 minutes before our scheduled dinner party with The Wife's boss. The entrance to the room at Big Blue, full of hundred year old coal ash. I crawled through it just before the dinner party. While The Wife was at home preparing for the dinner party, I was downtown at "Big Blue". Big Blue is what we call my downtown restoration project. It is the last Delaware Avenue house located near Niagara Square. I have been slowly excavating coal ash from a 1000' room off of the basement. Nobody has been in there in decades. To show-off for my Facebook friends, I agreed to crawl all the way in there and take pictures. I succeeded. So, thirty minutes before the dinner party with The Wife's boss, I was covered in hundred year old coal ash. Just thirty minutes from coal ash pile to dinner table! That old basement was pretty creepy but the most terrifying thing was the look on The Wife's face when I walked in the door covered in hundred year old coal ash dust - minutes before the dinner party. The picture above demonstrates my command of just-in-time inventory control. Today I took my mom to the Meating Place! We had been to two estate sales and driven all over Greater Buffalo and I had to get to the Meating Place before it closed so I took her with me. I had to get to the Meating Place so I could pick up the lamb chops Vinnie had packaged up for me for my office cooking club. 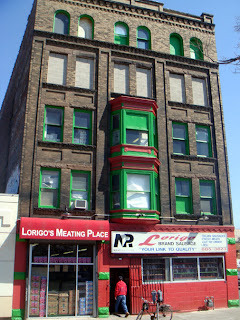 The above picture of the Meating Place is cribbed from the Internet. It did not look that sunny in person today. My mother frowned as we drove down Grant Street. "Is this a bad neighborhood?" she asked. I said: "Mom, it's the worst." Which is a terrible thing to say seeing that it is not far from Leonard Pennario's old neighborhood! Well, I am kidding about it being the worst. It really is not that bad. It is just, shall we say, urban. Which my mom is not used to. At the Meating Place she was going to stay in the car and listen to the end of "Carmen" which was playing live from the Met. But then "Carmen" ended with Don Jose stabbing Carmen and my mother decided to go into the Meating Place with me. Immediately there was this urban atmosphere. The staffers at the store were yelling at each other at the top of their lungs, never mind that it is a small shop, at least on the first floor where the public goes. There were about 12 different ethnic groups in there, all of them wearing scarves on their heads and dashikis and whatnot. Then Vinnie, the butcher I love, he went and rewrote the whole recipe I was supposed to make for office cooking club. I am supposed to be making Lebanese Lamb Chops With Lemony Lettuce. But here is where the plot thickens. The recipe says to grill or broil the lamb chops but Vinnie says you should not broil them! He says to roast them at 375 degrees for about 45 minutes. Zut alors! Meanwhile this was funny, the whole time I was talking to Vinnie, I am holding this basket and there is this thump, thump of things falling into my basket. It was my mother who was shopping for cheese the whole time. She loved the array of cheeses at the Meating Place and she was dropping cheese into the basket. My mom also bought a pound of yeast for bread baking and two kinds of whole-wheat pasta. I believe next time I go to the Meating Place she just might go with me! There is great upheaval in the house because I am to play host the office cooking club. That is a group of six people from the office in addition to their guests. Larry has been here twice this week helping to clean. Remember Larry? He is the Robo-Cleaner. Howard took pictures of Larry when he was here today. Larry vacuumed and cleaned the fridge and he polished all the wine glasses I had in the cabinet. Thank you Larry! Also he scrubbed the windows and he swept the floor and he polished up the handle of the big front door. He polished up the handle so carefully that now I am the ruler of the Queen's Navy! Seriously, I am the talk of the office. People are asking me about my efforts to clean up my house. "It's hopeless," I always say truthfully. "But I am trying." This morning I was up early and before I worked on my book about Leonard Pennario and I cleaned out my kitchen shelves. It is funny how you feel you are accomplishing something dumb like that. By the time I sat down to do real work I had my head together and I felt out of the woods. I tried to throw stuff out. I threw out a stack of old magazines I had gone through and cut recipes out of. Now I see why I have the difficulties I do. The other day I had gone through a box of vinyl someone had given me. And I managed to weed out about 10 albums I did not want, that I could take to Goodwill. This morning, here I am piously getting them together and putting them near the door. I picked up the top record. It was "101 Strings Play the Blues." I rolled my eyes and thought, that's right, these are the records I was giving away. 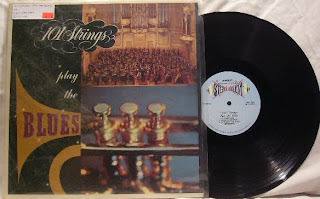 I thought: "101 Strings Play the Blues"??? How can I throw that out? The album says it is in tribute to W.C. Handy. That is classic, 101 Strings playing the blues in tribute to W.C. Handy! Who could dream that up? So back went that record onto the stacks of records I treasure. Here is 101 Strings playing "The Days of Wine and Roses." In Spanish it is Orquestra 101 Cordas. They have their own Wikipedia page. It says they were all male except for the harp player. And yet another reason why when my office cooking club descends, I will not be ready. I just realized that Eduard Kunz de-friended me on Facebook. 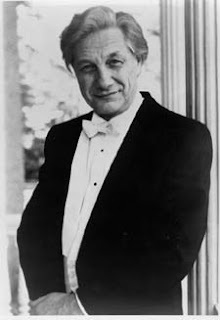 He was the pianist who was a contestant in the last Van Cliburn Competition. Eduard Kunz is from Siberia. I friended him because of his name and explained I was the music critic in Buffalo and I sent him a few jokey messages of encouragement. That was it! I was never a pain! But he de-friended me. Why would a pianist who is 28 and want a career de-friend a music journalist who is nice to him? It is not as if I hold the keys to anyone's career in my hot little hands but still. You would think, all other things being equal, keep me on the rolls, you know? I hope when I wrote about him I was not obnoxious! I did not think I was. Here is a picture of Eduard Kunz reflecting on my Facebook friendship and is deciding it is not worth it. Things like this mystify me! Generally if you are "de-friended" you can understand why. For instance I was dropped by that British editor named Toby Harnden I wrote about that one time. I bet I know why that happened. I was new on Twitter and I looked for him and followed him. Then he was the kind of Twitter person who twittered constantly, from whatever press conference he was at. I found them interesting but I was thinking I should use Twitter just for music purposes and they were gumming things up. So while I was trying to figure this out I "un-followed" him and "followed" him several times, twice or three times. As I said I was new on Twitter and now I see what was happening was, he was getting emails whenever I dumped him and put him back. Ha, ha! Zut alors! So, OK, I can see why Toby Harnden "de-friended" me. That is one of those situations where you want to apologize and explain but anything you say will make it worse so I just left it. But Eduard Kunz? I do not understand that. Here in Buffalo everyone friends everyone. It is perfectly normal to get a friendship request to someone you do not know and have never heard of. But you always hit "confirm." It is just what is done here. You never ask anyone: "Excuse me, where do I know you from?" Oh, well, it is of no moment. It is time for today's topic. 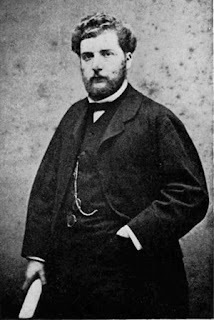 Today's topic is not Eduard Kunz. It is dumb ads featuring laptops! That is a goodie at the top of the page. Who in the world has ever used a laptop like that! At the end of a dock. That is tremendous. Here is another annoying laptop picture. 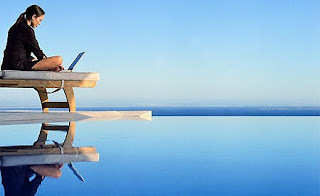 I tried using my laptop like that in California for the first few days when I was there with Leonard Pennario and I am telling you this, you quickly get sick of using a laptop like that. You do not use laptops the way these people are using them. You do not. Maybe Eduard Kunz does! But normal people do not. Now, this I could see. I love how this picture was identified on the Internet: WomanWineLaptop. Hahahahahaa!! That should be the name of my Web log. Last night we went to our favorite new jazz club, Bobby McGee's. Above is a picture of our friends Lou and Gary at McGee's. Here is a picture of the action. I am at Howard's computer and not mine because I cannot get mine to turn on. Were I on my own computer, you know me, I would be running a picture of Leonard Pennario. Because listen what happened. Yesterday after a long day at work I was in the coat room struggling on with my coat when my cell phone rang. And I answered it. And it was the grandson of a former head of Columbia Artists Management! 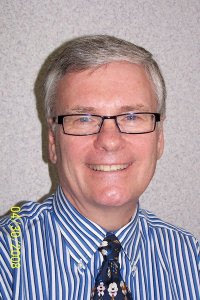 He is this wonderful gentleman from California who heads up an aerospace company. Everyone who calls me about Leonard Pennario seems off-the-charts brilliant, I must say that. Remember the woman who designed the Sidewinder missile? And there was that other woman who designed the computers for national defense. I cannot even begin to think of them all. Anyway, I loved talking to this caller yesterday, even though I was brain-dead, sitting there on this coat room couch with one boot on and one boot off. He told me at one point that his sister was Pennario's goddaughter. I was trying to say something about how Pennario had several godchildren in Buffalo but this is the funny thing, I actually could not articulate the sentence. That was how zoned I was! The Columbia Artists Management head's grandson then explained gently: "It's a Catholic thing." Hahaha! Just the idea of someone thinking he had to explain that to me. That cracked me up. Well, here I am with the name Goldman. This morning I was trying to get in order a few things I would like to discuss with this gentleman the next time we talk. So I got on this Columbia Artists Management page. They have this neat graphic and it was fun to watch it. They have this long parade of historic Columbia artists coming at you. People I love. Like Richard Tauber. 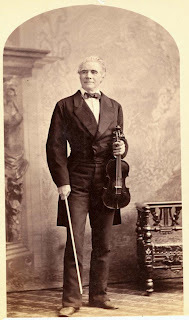 Gregor Piatigorsky. Jascha Heifetz of course. Pablo Casals. They list Casals as a violincellist. That is a term we should start using! But of course at the same time I am enjoying this graphic I begin getting grouchy because I do not see Pennario and what the heck, you know? I start resenting all the pianists I see. Rudolf Firkusny. "Who cares about him?" That is what I said out loud over my coffee. Jorge Bolet. "Jorge Bolet? Big, big deal." 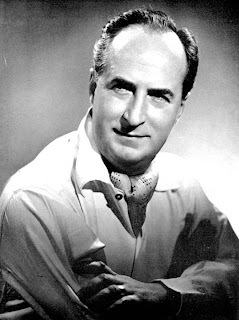 Jose Iturbi. "Who remembers him?" I know, I was being mean and dismissive, but this is the way I get when I am provoked. Pennario was better than these pianists, I am sorry! Then I saw his picture!! I could not believe it! He is right at the end and after the Trapp Family Singers but still. Kudos to CAMI, for paying tribute to Leonard Pennario! So much has been going on what with my Crock Pot and everything that I forgot to talk about dinner on Sunday night at Avant! What a wild dinner that was! See that picture up above? That is the restaurant in Avant where this dinner took place. We were sitting at that exact table where the people in the picture were sitting. The dinner was so we could meet a friend of our dear friend Judi's named Arnold. He is from Toronto except he moved here. That is a long story and it involves Montreal and New York City and Vancouver and many other of the world's great cities, I forget which ones. What I do remember is, right away Arnold and I got into a fight. It was about Mozart. Arnold said he thought Mozart died too late rather than too soon. That was within the first minute! I put a smile on my face and thought: Glass of Red Wine, Coming Right Up. Then the talk turned to Wagner. Never good news! And Arnold stated his respect for Wagner's "great anti-Semitic literature." None of us knew what to say! Judi said, "I didn't know there was such a thing as great anti-Semitic literature." Buffalo Statler with Big Blue (big white then) visible on left. ... which, note to out-of-town Leonard Pennario fans, is a hot-button issue in Buffalo right now. 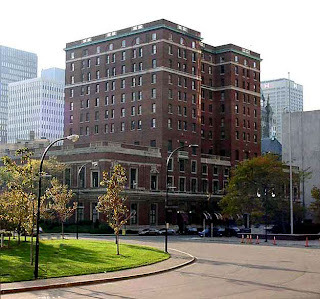 It is this historic hotel that was auctioned off to a buyer who, it turned out, could not pay for it. Now it is in limbo and we are afraid it could be knocked down. Arnold thought the Statler should go. Howard and I responded with, what in the world, you come in from Toronto and you tell us we should knock down our historic hotel! You are telling us our historic hotel is crap? Well, OK, we were a little more polite than that. But not much. The ice was officially broken when I ended up apologizing for the Holocaust. Every once in a while at highly dramatic moments I wind up doing that. Because my family is German and even though we have been in Buffalo since 1860, I feel bad about everything, so I say something about it. And another thing! I was put in the position of defending the Catholic Church. You know those social bans on talking about religion, politics, etc.? We violated all of them, boom, boom, boom. That is a dinner to remember! Back to my apologizing for the Holocaust. What strikes me as odd, now that I think about it, is that my apology is always accepted. You would think someone would say: "Get out, Mary, number one you were not born yet and number two your family was in Buffalo." But no one has ever said that! Everyone accepts my apology. Which, I meant it to be accepted, so maybe I should not be surprised. But I am. One thing nice about Arnold: He was familiar with Leonard Pennario. A most excellent thing in a person. Zut alors, I am behind a day! Here it is Monday night and my last post was Sunday. Tonight I made the greatest dinner. Well, I thought so anyway. I had beef top round from Jubilee and I made shish kebabs under the broiler. Top round is a magic cut. For some reason you can cook it real quick if you like instead of braising it for hours as stew or pot roast. For these kebabs what you do is cut your top round up into cubes about an inch, inch and a half. Then you marinate them for about an hour in a kind of vinaigrette. It says two hours but I say one hour. You also toss into the bowl an onion cut into wedges and a pepper cut into pieces. I have also used zucchini and mushrooms. Then you put the skewers under the broiler and they cook in about 10 minutes and it looks fancy and you can be proud of yourself. We ate our kebabs with an, ahem, mushroom ragout, and my favorite vegetable, Swiss chard. I did the Swiss chard up with raisins and walnuts and olive oil and I am sure it was a million calories but boy, was it good. I made beef stew in California for Leonard Pennario. I should have made this! Admit it, isn't it fun to eat in cold weather? There is nothing like sitting around eating and looking at the snow outside. It is even better if you have people from work come back to your house and eat with you. I do that sometimes. I wish I had done that tonight. You can cook things up in the winter in Crock Pots and in heavy iron pots, which I love to use. That is why I have to get a gas stove. All I have now is an electric stove and it is a nice stove but it has this smooth cook top which is not made for my Jurassic iron pots. I had two pots on the stove tonight, one for the mushrooms and the other for the chard. I also love to roast things. I love to roast vegetables. Last week I made roasted carrots. You did not have to pre-boil the carrots or anything. You just tossed them into this pan with I forget what, olive oil and kosher salt, I think, and thyme. Then you covered the pan and roasted them and took the cover off and browned them. It took something like 40 minutes but where did I have to be. This morning I made white bean soup. I made it in the Crock Pot the night before. Here is my heirloom recipe. You take one 1-pound bag o'dried beans, plus one chopped-up onion, plus one chopped-up carrot, plus a handful of chopped-up celery. You put them into the pot and cover it with water. You go to bed. In the morning voila! White bean soup. It is yours to salt and spice as you like. This morning I washed up a bunch of turnip greens and added them to the soup. That is another vegetable I love, turnip greens. I love their texture and their taste. Wow, I could yak about food forever. Here is my favorite dinner if Howard is off somewhere and I am alone in the house with no one to watch me eat. I like to take a big iron pot and brown up a cut-up onion, then toss in a couple of chicken pieces and brown them, or not, as you like. Then you throw in a few sliced-up carrots, and a big lot of cut-up greens. 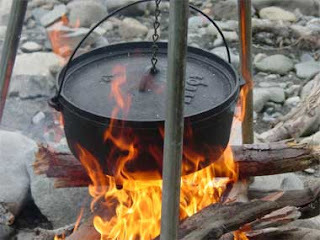 You cover the pot and they cook for about half an hour. Then what you do when the chicken is done is, you take a big shallow soup bowl and you just ladle it out. It is so sloppy but so good! And it looks so pretty with the green and the orange. Once I made that dinner for my mother and me over at her house. She loved it but she agreed with me that it was not something you should eat in front of people. It is just too sloppy! Another dinner if you are on your own and free to eat what you like is, take a butternut or buttercup squash. Cut it in half. Roast it and eat it like a baked potato, with butter and sour cream and salt and lots of pepper. That is the greatest dinner! Accompanied by my old friends turnip greens or chard it is also very pretty because you get that green and orange effect. This is a wonderful world and new people who knew Leonard Pennario keep appearing as if by magic. Yesterday a man wrote to me from the Arctic Circle. Norway is in the Arctic Circle, isn't it? I am looking at this map and trying to figure that out. Hmmm. Come to think of it Buffalo is pretty darn close to the Arctic Circle itself. Tonight Howard and I went to dinner at Della Terra. That is the restaurant at Avant! And our boots went crunch, crunch, crunch in the snow. That only happens when it is really cold! That and you can see smoke coming out of the smokestacks of Buffalo factories, not that we have many of them left with all the government interference. But when one is still in business, you can see the smoke. 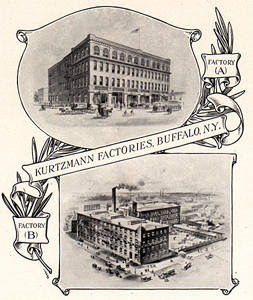 See this lower picture of the Kurtzmann piano factory? That is Factory (B). There is this one factory I pass on the way to work that on cold mornings looks just like Factory (B). Back to this Pennario fan. He is in Norway with his wife and their baby son. I wonder if he knows Ole Bull State Park. Remember Ole Bull State Park? Anyway, he told me that he knew Pennario when he was growing up. His father had been with Pennario in the Army, in China and Burma and India. He loved bridge, and Mom and Dad would try to set up a game for him, when he came through. One of the last times, when I was a teenager, he and my family went over to the Hubbards' house to use their piano. Mary Lou and Karen Whitmore - both very pretty girls - were there, and they wanted him to play some rock and roll tune for them, which he did with great elan. Ha, ha! That is Leonard. America's greatest pianist! I would love to know what tune that was. Today I went for the first time to the Metropolitan Opera Simulcast at the Elmwood Regal. I took my mom. 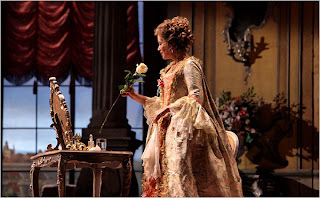 The opera was Richard Strauss' "Der Rosenkavalier." That is a still from it up above. It is beautiful. 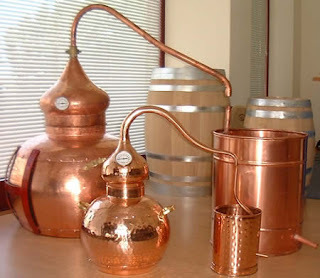 What about a whiskey still? I could have used one at the Elmwood Regal ! For reasons I will get to in a second. Through a strange sequence of events we were the last people into the theater and we had the worst seats, way down in front. It felt funny at first because the singers' faces in the closeups are about a mile wide, and you feel as if you're looking right down their throats! But you get used to it. Eventually I got to love my seat, my head tipped back, the music swirling around me. 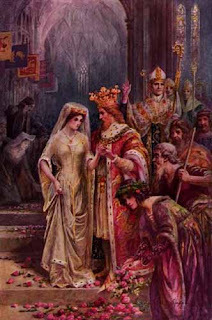 Number one, the music stopped at exactly the big moment in Act II, when the Knight of the Rose -- that is what the title means -- arrives to present the silver rose. It is a long story. Just trust me, this is a high point. You wait and wait for this one moment, when the music hits this high note and the knight of the rose appears, all in silver and white, at the top of the staircase. If you are like me you burst into tears. That is how beautiful it is. Well, today I burst into tears, but not for that reason. Because the sound went dead. It was like once years ago when I went to the Granada Theater and saw "Gone With the Wind" and the film skipped at the end so all we heard was, "Frankly, my dear ... damn." "Frankly, my dear ... damn." That is something I will never forget! But at least then the theater was in its last days and the movie was crackling and struggling all the way through, so it was not exactly a big surprise. This was a surprise, at "Der Rosenkavalier"! It took me about 15 minutes to get over it. Here is a clip of another production where you can seen and hear it. It is almost at the end, 5:13. Try to watch a little before so you see the build-up. The thing is, the blond woman, she has been betrothed to a man she does not know. And this man sends another man to present her with a silver rose as a token of their betrothal. She is all in a tizzy waiting for the rose and all the townspeople have turned out to see. Finally it arrives, a procession of carriages, a parade of footmen. Then the Rosenkavalier himself appears. That is the big moment, 5:13. That is when the sound cut out. After that I could never enjoy it the same way again. I could not trust that the thing would not falter at a part that I love. On break I ran into a few people I knew and I complained copiously about this screw-up. I said, I thought the Met owed everyone free tickets to another opera, because that was unforgivable. No one but me seemed upset! One woman said breezily, "Oh, that happens." OK, back to our seats. We get to the end. "Der Rosenkavalier" ends with an incredibly beautiful 15 minutes. It is famous for its sublime ending. I began to relax. What do you know, I thought, we have made it to this point. This is going to be all right. And then a cell phone rings in the row behind me! Right when they are going into the final duet! It gets louder and louder. I am sinking down in my seat thinking, this cannot be happening. But I could not believe what happened next. "I'm at the opera," he says. "It's almost over." I could not believe that. Normally I am a little in sympathy with people whose cell phones go off. I think, there but for the grace of God go I. But you cannot go ahead and talk, you know? I turned around. "Shhhhh!" I said. I did not know what to do! Now the guy's mad. He gives me this look. Then he gets up and he starts to make arrangements to leave. He has on one of these noisy down coats, those noisy Buffalo coats, and it is going swish, swish, swish. He leans over and blows his nose, noisily. I am going to get into a fight, I thought. It will be like when I went to "Tannhauser" with Leonard Pennario and Pennario got into a fight. Here he is yelling at this guy and I am whispering to him, "Leonard... Leonard, please. 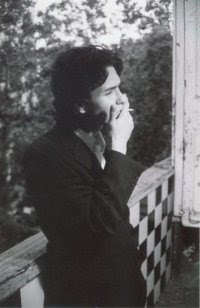 Leonard." But at the same time I think I was a little proud of him, getting into this fight. Now it was happening to me! As soon as the lights went up I was going to call the guy a creep. But he slunk out right before the thing ended. After ruining the opera's ending for me. Because my mind was all occupied with how I was going to settle things with him. You know what, I am just not sure if this operas-at-the-movies thing is for me. Maybe I will write an opera about slugs and oiks! The Buffalo Athletic Club is offering a Zumba class! My friend Nicole takes Zumba and she was telling me about it at our office Christmas party and now I am thinking I should try it. I do not know quite what Zumba is except judging from Nicole's dancing at the party it is a kind of loose-limbed dance with your arms akimbo. It looks like fun and judging from how slim Nicole is, it burns a lot of calories. Thinking about Zumba makes me marvel at how exercise fads have come and gone during my last couple of years at the BAC, which is, incidentally, where Leonard Pennario used to go when he was in town. 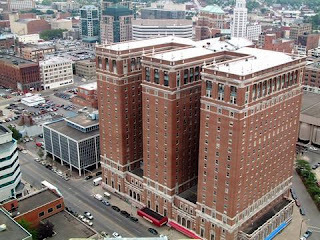 That is the Buffalo Athletic Club pictured above. Other people can go to ugly, gritty gyms. Leonard liked stentorian and august gyms and so do I. It is funny that the modes of exercise at the BAC have not proven as long-lasting as the building. There were the resistance ball classes. I actually prefer the term medicine ball! I have one at home now. Sometimes I like to stretch over it like this. Ahhh! Feels good. A couple of years ago the BAC got all these resistance balls and that was the next big thing for a little while. You chose a blue or a red ball and you would do all these exercises with them. Some of them were the same-old squat-squeeze kind of stuff but there was some that was fun. You would half sit on the ball and do steps to the left and the right in kind of a swingy motion. Now the blue and red balls sleep on these big shelves and they have seen no action in forever. Also at the BAC I observed the rise and fall of the Katami Bar. 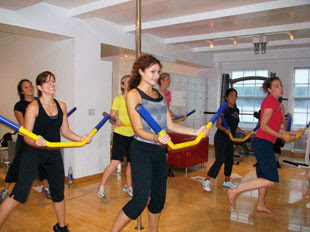 Here is a picture of a Katami Bar class. When the Katami Bars were new, which must have been three years ago, the interest in them was so great that you had to get tickets to attend the classes. I remember sitting around work one day watching the clock all excited because I had a ticket to the 6:30 p.m. Katami Bar class. Which, I have to say, I liked. You took hold of the bar and put it behind you and swiveled with it, kind of like doing the Twist. You held it over your head and bent from the waist to the left and to the right. It is true that you still had those squats and squeezes and lunges. You cannot get away from those. But parts of the class anyway were fun and graceful, which I liked. I like graceful exercise. That is why I like Pilates and yoga. Now the Katami Bars rest in peace in their big tubs on either side of the gym's exercise room. Katami Bar classes? They are so 2007! How come the classes I kind of liked disappeared but Kickboxing goes on forever? Who wants to do Kickboxing? What do they think I am, a 14-year-old boy? Anyway, I will zoom on into Zumba but I will try not to get too attached to it. It will not be long till Zumba, zut alors, goes the way of the Katami Bar! At Jubilee, all is forgiven! That is because last night when I was shopping on the way to my mom's, the checkout girl stopped and stared at me. "You got your braces off!" she exclaimed. I said, "That is so nice of you to notice!" She said she had had braces for about four years, from about 6th through 10th grade, did I get that right? It was an awfully long time and the only reason her ortho finally took them off was because she had to go to the prom the next day and she just insisted. When I am through with my book on Leonard Pennario I am going to write a book about braces. They are fascinating! My ortho and I spent my first non-braces day posting noble pronouncements on each other's Facebook pages. First I wrote that he was the Leonard Pennario of orthodontia. And he wrote: "Thank you for that high compliment. I'm just doing my job the only way I know." Just like Pennario! See, I call 'em as I see 'em. "It was a pleasure having you as a patient. 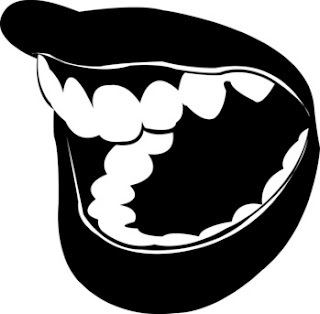 Remember, the orthodontist is only as good as his/her patient. I need cooperative patients to achieve the results I do. You were terrific and did everything I asked. Thank you!" My ortho is Dr. Kevin Hanley in case anyone else in Buffalo has too many teeth and wants to get the situation straightened out. That is his Facebook picture to the left! I lucked out, I am telling you, because one day after Gloria, Pennario's diva friend, had gotten to me, I saw his office right in my neighborhood and I walked in. And they got me started that very day! I was lucky. Here no one had referred me or anything. I was just this walk-in. And yet he is the greatest! He is the Leonard Pennario of teeth, I am not kidding. The Jubilee clerk told me, "Isn't it great, not having to get your braces tightened? When I used to get my braces tightened, I never wanted to talk to anyone. I used to just sit in my room." We were laughing that now all that is behind us! Other people in line at Jubilee were laughing too. Hmmmm. Last night was the night Ugly Betty was supposed to have maybe been getting rid of her braces. I wonder if that came off! Yesterday I heard a wild rumor about the Obama birth certificate situation. Someone emailed me that the lawsuits over that had "quietly" reached the United States Supreme Court, and that the court would be taking on the cases. The email said that Antonin Scalia had said something about it, that the court would consider it, something like that. I was trying to verify the rumor but you know how it is, it is like we live in China or somewhere and it is impossible to corroborate or disprove anything. That is too bad. I am interested in the doings of Antonin Scalia because he is a Leonard Pennario fan. Here is something else about Antonin Scalia. Remember my Uncle Bob? He makes appearances on this Web log now and then. His memory does, anyway. Once my brother George was quizzing Uncle Bob, who was a history professor, about various Supreme Court justices. Uncle Bob was rating them as to how conservative they were. They got to Scalia. George read off his name. Uncle Bob said: "Like a rock." Ha, ha! George and I love remembering that. We were just reliving that the other day. Speaking of reliving things, yesterday I had so much fun talking about supermarkets I thought I would return to that topic.The other day in Tops when I was wandering around waiting for them to kill and steam my lobster I began taking pictures. You know what fascinated me? Those religious candles. There is half an aisle of them! I saw a candle dedicated to Our Lady of Guadalupe and to be honest, I was tempted. Because I was married on Dec. 12 which is the feast of Our Lady of Guadalupe. And there was a prayer on the candle for the Pope. But then I noticed that the same company that made that candle made all kinds of hoodoo candles too. This candle was not blessed or anything. I decided it was best not to support this industry. Although you know what? I wonder if we will see this kind of thing passing away. And when we do that will be too bad. I would not want the hoodoo candles sticking around but if people burn candles for Our Lady of Guadalupe or for St. Anthony of Padua that is probably all for the better. Here is the Our Lady of Guadalupe candle. My church is St. Anthony of Padua and he was there at Tops, too. I wonder how many people light candles to St. Anthony when no one is looking because they cannot find something in the store. I should have lit it because I could not find raisins, no matter how hard I looked. At the top of this post are the candles for the Sacred Heart and the Holy Spirit. And they covered St. Michael the Archangel too. It is funny but I do not see these candles at Jubilee. Well, they have the Harlem Helpers. They are not the 14 Holy Helpers but they are something anyway. All right, this was fun but now I must needs return to the kitchen. Those mushrooms I fought over at Jubilee?